Steaming is an ancient Asian cooking technique that will perfectly complement your contemporary eating habits. It is not only an easy and quick way to cook, but the results are also delicious and healthy: the steaming process gently envelops food with even heat to retain food's natural juices, vitamins, and minerals, which might otherwise be lost in the cooking water. Steaming food holds a firm texture, securing all of its flavor and brilliant color. Steaming, the comprehensive guide to steaming food takes the home cook through each recipe with step-by-step instructions, and provides information on how to use a variety of steaming equipment, including tips for creating steaming implements at home. 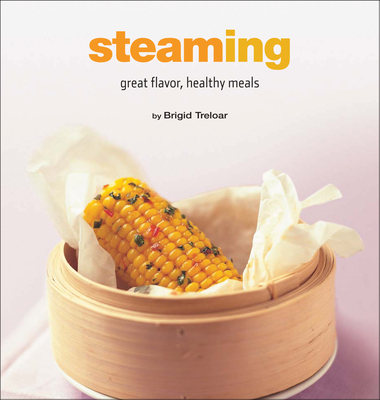 Brigid Treloar's experience and culinary skills are wonderfully showcased in Steaming. Brigid has been working as a food stylist, consultant and teacher for 20 years, and she is a presenter of specialist cooking classes at many top hotels and cooking schools. Throughout her travels in Europe and Asia, Brigid has gathered wonderful ideas and cooking techniques, and has prepared a truly enjoyable combination of recipes. She has also appeared on numerous television and radio programs, and writes for many magazines and newspapers. Brigid also advises many leading food companies on product and recipe development, food styling and photography and provides recipes, cooking information and tips for company web sites and online chat sessions. She lives in Sydney, Australia.